Otters- one of the world's most adored group of mammals! No other carnivore blends mischief and agility like otters do. 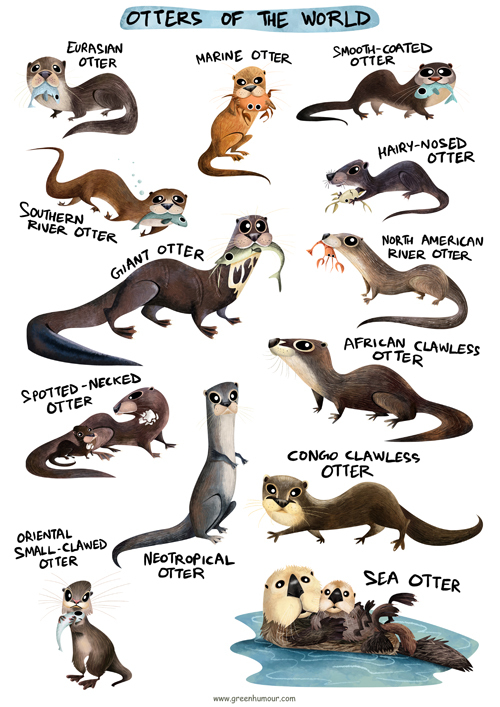 Spread across the world as thirteen species, otters inhabit waters both temperate and tropical, inland and marine; and are important predators that check the populations of fish and help maintain the good health of aquatic ecosystems. Hunted indiscriminately for their fur, which is the finest for any animal on Earth, otters have faced a drastic decline the world over. Today, several otter species are grappling with hunting, habitat loss, and water pollution. The Eurasian Otter is the most widespread otter species. Found across Europe, Asia and Northern Africa, this animal prefers freshwater, but also occurs in coasts rarely. In India, the Eurasian Otter is found in the Himalayas and the Western Ghats. The species is classified as 'Near-threatened' on the IUCN Red List. The Smooth-coated Otter occurs in wetlands, swamps and river basins of India and South-East Asia. A very vocal and playful animal, the Smooth-Coated Otter can often be seen engaged in play with other members of its species. It is listed as 'Vulnerable' on IUCN's index. The smallest otter in the world, the Oriental Small-clawed Otter is found in India (Western Ghats and the North-East), and South East Asia. As the name suggests, its claws do not extend beyond the fingers. This species too, is listed as 'Vulnerable'. One of the rarest otter species, the Hairy-nosed Otter of South-East Asia is identified by the hairy vibrissae at the ends of its nose. The otter hunts fish and crustaceans along inland rivers. It is endangered because of habitat loss and hunting. 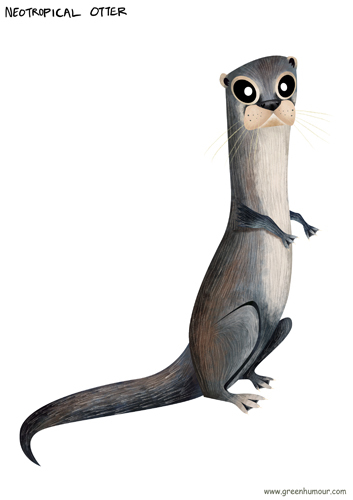 Native to Sub-Saharan Africa, the Spotted-necked Otter inhabits inland rivers and streams. It is identified by the white spotted patterns on the neck, with considerable variation existing among individuals. Also called the Cape Otter, the African Clawless Otter is the second-largest freshwater otter (after the Giant Otter). Its feet are clawless, with the exception of a few hindfeet. It is 'Near-threatened' on the IUCN index. The Congo Clawless Otter is a rare otter endemic to the Congo Basin in Central Africa. 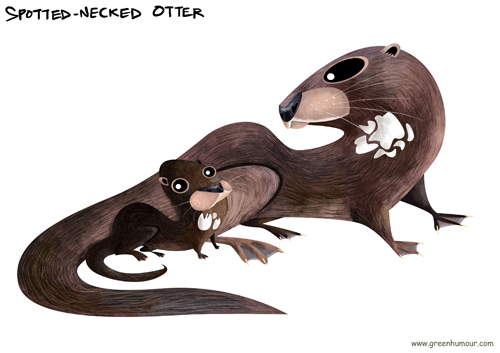 Although it is extremely similar to the Cape Clawless Otter (and has been recently split as a separate species from the latter), it can be identified by the pale guard hair on its forehead and nape, that give it a 'frosted' appearance, and also from the pale lining around the markings over the snout. Hunting and habitat destruction are its immediate threats. Endemic to North America, the North American River Otter inhabits both freshwater and coastal habitats, where it hunts fish, frogs, mussels and clams. It is found across Canada and parts of the USA. The Neotropical Otter occurs in Central America, South America and Trinidad and has the widest range among New World otters. It lives along fast-flowing rivers in different kinds of habitats- forests, grasslands and the Pantanal. The Neotropical Otter is 'Near-threatened'. Although this species is called a river otter, it inhabits both fresh and marine water. The Southern Rver Otter is found in South America in Chile and Argentina. The species requires dense vegetation along shorelines to thrive, and is endangered because of hunting and habitat loss. A rare and endangered otter, the Marine Otter of South America occurs in coastal Peru, Chile and Argentina. Its exclusivity to marine habitats makes it the world's smallest marine mammal! 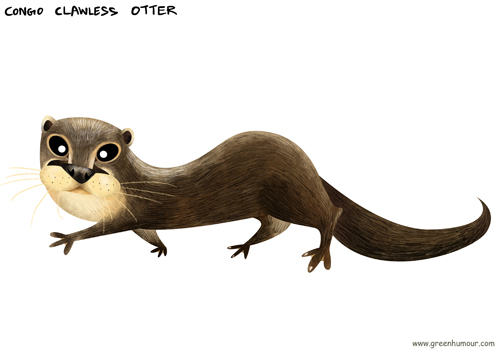 It is also the second-smallest otter, after the Oriental Small-clawed Otter. The Marine Otter is endangered. Found in the Amazon Basin, the Giant Otter is the largest freshwater otter species. Extremely social animals, Giant Otters live in large family groups headed by an alpha pair. The markings on their necks differ among individuals, and are used by group members to identify one another. Giant Otters are very vocal, and use a variety of vocalizations, threat and alarm calls to communicate. They are also an unusually fearless species, readily challenging larger predators like Jaguars and Caiman! Their fur is the shortest among otters, but highly valued as pelts. 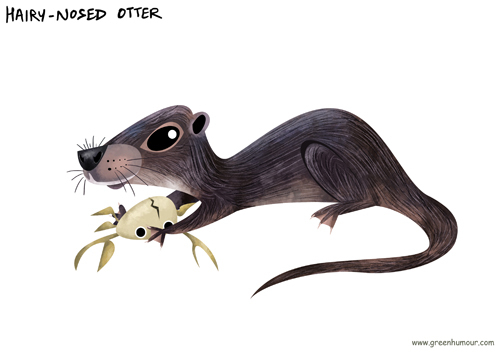 Owing to hunting and habitat loss, the Giant Otter is endangered today. Found in the coasts of the Northern Pacific Ocean, the Sea Otter is one of the most well-known and iconic otter species. Sea Otters are among the few mammals capable of using tools- they use rocks to crack the shells of molluscs! Sea Otters are a keystone species that feed on sea urchins and help maintain kelp forest ecosystems. They are also known to be very dedicated mothers. Despite inhabiting the cold seas of the North Pacific, Sea Otters lack blubber and rely on their dense fur for insulation. Sea Otter fur is the finest in the animal kingdom, and has unfortunately made them a soft target for the fur industry, landing them in the 'Endangered' category on IUCN's Red List. The compilation, as well as individual illustrations are available as prints, apparel and a wide range of merchandise on my webstore here. Go on, and bring these furballs home!